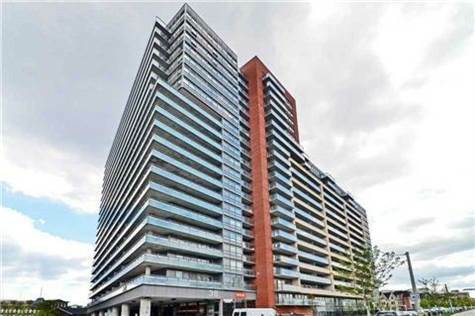 Toronto Real Estate Blog - GTA News : Spectacular Dufferin Apartment For Sale !! King/Dufferin, Toronto - Welcome To 38 Joe Shuster Way! This Is An Affordable Jr 1 Bedroom Industrial Loft Unit With 9 Foot Ceilings With Exposed Concrete! It's A Great Upgraded Unit With Soft Close Drawers And Laminate Floors! All Electrical Fixtures And All Window Coverings Are Included! It Is Walking Distance To The LCBO, Liberty Village, 24 Hour Good Life, 24 Hour Metro, Starbucks, Exhibition, GO Train, Ttc, And Trendy Ossington Restaurants And Bar! The Living Room And Kitchen Are Combined Into An Open Concept. The Living Has A Walk Out To The Balcony, Where You Can Enjoy Toronto Views! The Kitchen Features Great Granite Countertops, Subway Backsplash Tiles And Stainless Steel Fridge, Stove, Microwave And Dishwasher! The Building Includes Amenities Such As Indoor Pool, Concierge, Visitor Parking And Guest Suites! We Love Affordable Condos - We Search High and Low for Them and They are Our First Pick for Clients - You Don't Have to Break the Bank for a Great Condo - You just need to know where to Look! Call us today for our Top 5 List! Welcome To 38 Joe Shuster Way! This Is An Affordable Jr 1 Bedroom Industrial Loft Unit With 9 Foot Ceilings With Exposed Concrete! It's A Great Upgraded Unit With Soft Close Drawers And Laminate Floors! All Electrical Fixtures And All Window Coverings Are Included!